During Sunday’s Community Time, we had a very special guest, Robbie Goldman, speak to us about the issue of homelessness and share stories about people living on the streets of Denver. He works for a non-profit organization called Dry Bones Denver, which works with youth who are experiencing homelessness. 1. You have unsurpassable worth. 2. You are unconditionally loved. 3. You have absolute security. 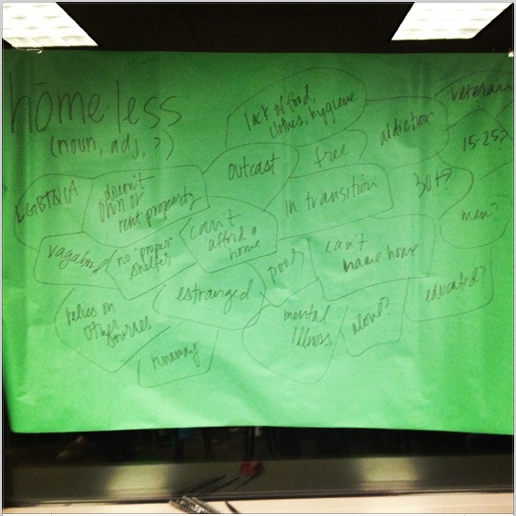 As a community, we were asked to define homelessness and came up with a wide range of definitions that fit the word. After a discussion as to what homelessness is and the reason behind its existence, we split up into our different majors or areas of study to answer the question: how can we use our skills or knowledge to end homelessness? Comment below with ways you see people working to end homelessness in Omaha or your hometown or ideas you have using your skills or knowledge. And special thank you to Robbie Goldman for taking the time to come to Creighton to speak to us and inspiring us all!